If we look at the incredible range of Orchid species it is no surprise that they one of the most popular plants in the world and that so many different hybrid cultivars have been developed over the years. Literally thousands of different Orchid species available in Australia, with some being native and many other species from around the world available for sale from specialist orchid growers. The fascinating thing is that new species are still being discovers, only recently Coelogyne usitana was found, and this is a beutiful orchid that is sought after by collectors around the world. 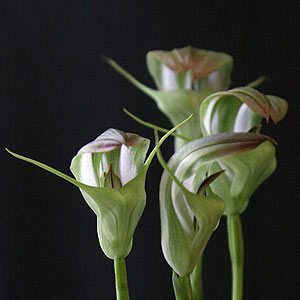 Rarer species can be found through Orchid societies where collectors have been able to put together some of the more difficult to grow and find species into interesting collections. Some nurseries import orchids, usually in flasks, on a regular basis so the number of species and hybrids available is continually increasing. How many orchid species are their in world? Around about 20,000 in over 800 genera. So we have the Dendrobium genera with over 1000 species in it including many Australian species such as Dendrobium kingianum. The largest group is the Bulbophyllum group, while the very popular Cymbidium group has only 50 or so species. And with Orchids new species are still being discovered, while others are under threat in their natural environment. So with so many different species or ‘types’ of orchids, from cool climate to tropical it is fairly easy to find an orchid species suited to your environment. With around 1500 species of native orchids Australia has some wonderful orchids, many of which are popular around the world. Thelymitra, Prasophyllum, Pterostylis, Oligochaetochilus, Jonesiopsis, Diuris, Diplodium, Corunastylis and Arachnorchis are some of the largest genera of Australian Orchids, with many individual species in each.